The town that harbors this pit is in habited by a simple, rural people who don’t need much. They make some money by selling their moonshine in town and buy some groceries to last them awhile. They thrive on tradition, and that tradition sometimes must involve a blood sacrifice to The Pit. When that need arises, Dawai–the chosen sculptor for The Pit–goes into a trance and molds a jug with a face on it, the face of one of the town’s inhabitants, and whoever’s face graces it must be sacrificed. Hence, the title. If that sacrifice doesn’t happen, innocent people will die until its need is sated. Larry Fessenden co-stars as Sustin, the father of Ada. I’m convinced that just about any movie that has Fessenden in its cast is worth at least a peak. He’s very good in this movie and has a natural charm and relaxed nuance that makes his performance look completely “invisible.” You’re never under the impression that you’re watching an actor act when he’s acting, it just looks like a person being themselves. Lauren Ashley Carter, the star of the film, is great, too. She’s got a quirky cuteness to her that isn’t overblown or sickeningly sweet, in some Hollywood kind of way. She has a unique look about her and she’s fascinating to watch. Her performance walks a very fine line of being perpetually in shock over everything that’s unfolding, but calculating enough to know how to get out of a pickle when she really, really has to. 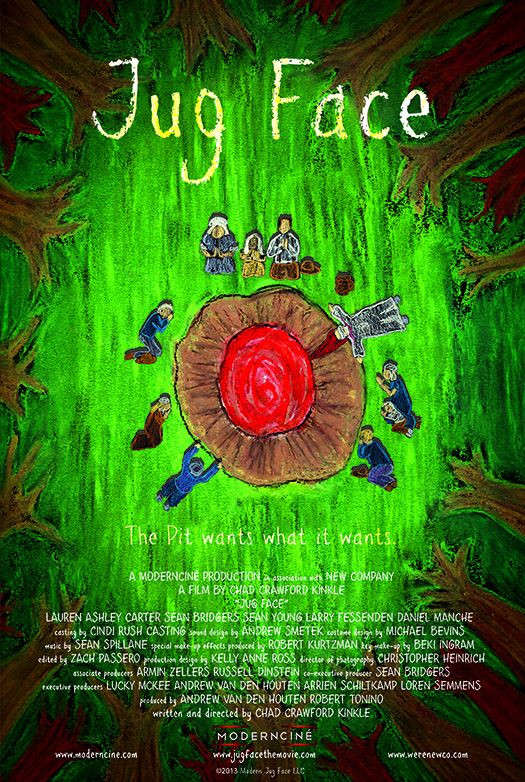 Made with a low budget, Jug Face is worth a watch. Its shoestring charm is in seeing what the director, Chad Crawford Kinkle, decides NOT to show or decides what not to say. He understands that mystery is the very essence of fear, and keeping much of the plot cloaked in that mystery is the best bet to keep in interesting. Right now, it’s available for streaming on Netflix and Amazon Prime. It’s not a perfect movie, but it’s a quick ride and different and unique from a lot of the horseshit (especially in horror) put out by Hollywood. It’s an original idea executed in an exciting way. I just hate the ghost. Oh, god, couldn’t they have cut that part out?